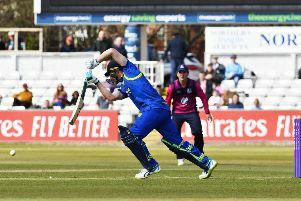 Durham batsman Michael Richardson was delighted to contribute to a Durham revival against Hampshire – but disappointed he got out without completing a century. Jackson Bird stunted a Durham afternoon comeback with two wickets in two balls as Hampshire edged the first day at the Ageas Bowl. Australian fast bowler Bird produced a thunderous spell with the second new ball to end a 142-run fifth wicket stand between Michael Richardson and Gordon Muchall. Richardson departed nine runs short of what would have been an attritional fifth career First Class century and Muchall ended on an unbeaten 85 as Durham reached 278 for six at the close. Durham had been reduced to 91-4 at lunch, with Mark Stoneman, debutant Graham Clark, skipper Paul Collingwood and in-form Scott Borthwick dismissed, but the partnership between Richardson and Muchall got them back in the game. Neither batsmen offered a sniff of a chance until Bird made the double breakthrough with the second new ball. Bird fashioned an in-ducker to Richardson, who didn’t offer a shot as he was struck in front, before Ryan Pringle edged to Vince at first slip next ball – to celebrate his 150th First Class wicket – the Australian finished with figures of three for 80. Usman Arshad blocked out the hat trick delivery but in the next over the all-rounder edged to Gareth Berg at third slip but the former Italian international spilled a tough chance diving forward. Richardson said: “It’s nice to get a biggish contribution, I’ve had a strange season so far so to put my foot down and kick on past 50 was nice. “It was very disappointing to get out for 91, it was a bit of a sucker punch but he (Bird) is obvious Test match class. He showed that by shaping to swing it away and it just nipped back. “I think the wicket is quite hard to score on. You only have to look at the amount of boundaries scored in the day, they were very disciplined.